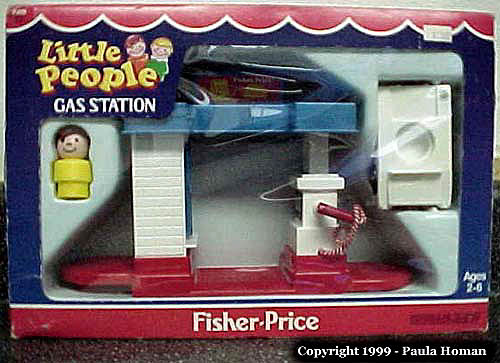 Description: This small quick-stop gas station is one of the smallest Original Little People sets that was made. The base has a small pay area with 2 blue doors, and a white gas pump. The base is oval-shaped with a hole on one end and a peg on the underside of the other end. The hole and peg allow the base to connect to the other two "Little People "Village" sets, see #2357 Little People "Village" Assortment. The three bases to interlock together. Two of the three pieces sold in this set are exclusive to this set: the base, and the car. B2455 - Gas Station Base - Small red oval-shaped base with a small white-brick-simulated quick-pay shop, a white gas pump, and a drive-up ramp on the base between them. A blue I-shaped roof fit over the pay shop and the gas pump. The pay shop has 2 blue doors that open and close. The gas pump has a braided cord hose with a plastic gas nozzle on the end. The red oval-shaped base has a round peg on one end, and a round hole on the other end to attach to either the B2453 or B2454 bases. FPT8519 - Red top, white base 1-seat car with a flat non-ribbed luggage rack behind the seats, a gas hole on the back corner, and the hood is NOT marked. 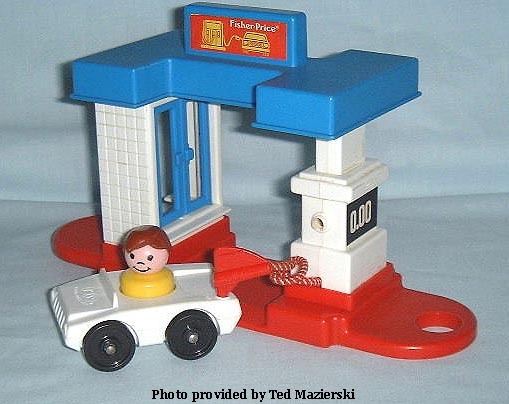 The bottom of the car is marked "©1969-1987 FISHER-PRICE". The car rolls on 4 black wheels with metal axles. The wheels are NOT marked "Fisher-Price Toys". Has a tow hook under the front "grill" area. *See "Variations" below. EZPP - All-plastic Original Little People boy figures with a yellow body and brown molded plastic hair. FPT677 - White top, red base 1-seat car with a flat non-ribbed luggage rack behind the seats, a gas hole on the back corner, and the hood is NOT marked. The bottom of the car is marked "©1969-1987 FISHER-PRICE". The car rolls on 4 black wheels with metal axles. The wheels are NOT marked "Fisher-Price Toys". Has a tow hook under the front "grill" area.